Getting a new piercing isn’t a decision to take lightly. Ideally, you’ll choose a piercing you’ll want to keep for years, but that’s easier said than done. It takes a true piercing expert that can help you navigate your options and deliver a high-quality piercing job that will heal well and look great. Serious piercing aficionados know that these 10 best piercing places in South Carolina are as professional as they come. This full-service piercing parlor is as professional as they come. Fans trust the expertise here not just to get a safe piercing, but also to get the right type of piercing they know they'll be happy with. They're also one of the most reasonably priced piercing shops in the state. This award-winning piercing studio knows how to exceed your expectations. Their team has over 50 years of combined experience, plus they meet all environmental and health standards so you can trust their skills. They make sure to take you through every step of the process so you know what to expect and how to help your new piercings heal properly. This full-service studio has an extensive collection of body jewelry to choose from. Their list of services span the full spectrum of piercing, so you can get the exact type of style you're looking for. Best of all, they're open every day of the week so you can get your new piercing around your schedule. Their passion for body mods reflects in every type of work they do. Most notable is there piercing Marathon, which is an “all you can pierce” extravaganza for one low price plus the cost of jewelry. They are professional in every sense of the word, so you can expect a safe piercing you're sure to love. Gentle piercing pros will help you reach your goals without the jitters. They truly care about providing a safe experience in the shop, but it’s their “after” service that sets them apart. Most of their fans are repeat customers, which says a lot about the quality of care they deliver. The name says it all: their process is nothing short of perfect. They’ve been a mainstay in Soda City’s piercing scene for over a decade, offering a variety of piercings and stunning jewelry lines to match your personality and style. They’re highly trusted and respected in the piercing community so you can feel good about their work. If you can pinch it, they can pierce it. Folks flock here for their dermal piercings in particular, but they offer a variety of other options to suit your body mods. With both male and female piercers on staff, you can partner with a professional that makes you feel comfortable to get the best experience and results. Offering the best of piercings and tattoos, you won’t find a studio that takes more pride in their work than here. Every piercer is professional and certified to ensure you get a safe, clean piercing. They’re also heavily invested in their own techniques and skills and continue to stay on top of the industry to hone their craft. Known for their high-quality tattoo work, this studio also has top-notch piercing services. Their award-winning studio and team make you feel right at home that help to take away any fear or worry about getting pierced. Prices are reasonable and the hard part is over before you know it. If you’re looking for a quick, easy, and mostly painless experience, this studio has you covered. Their piercing professionals make the entire process seamless so you can get straight to business and out of the shop without the stress. 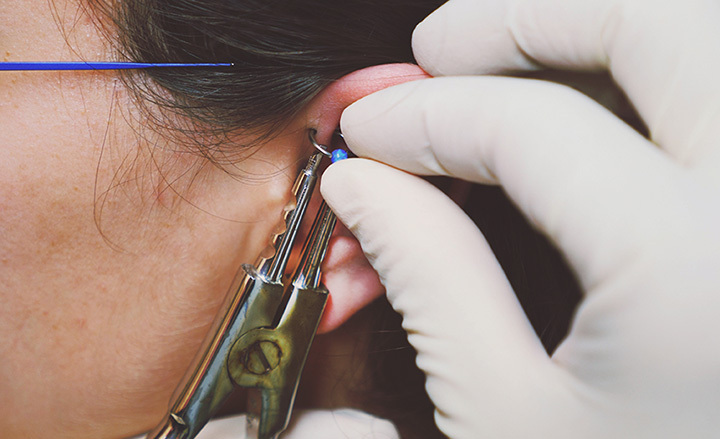 From ear piercing for kids and adults to a variety of all-over body piercings, they make it easy to get the look you’re going for.